This article is about the comic performer. For other uses, see Clown (disambiguation). Video of a 1954 episode of the Super Circus show. Modern clowns are strongly associated with the tradition of the circus clown, which developed out of earlier comedic roles in theatre or Varieté shows during the 19th to mid 20th centuries. The "clown" character developed out of the zanni "rustic fool" characters of the early modern commedia dell'arte, which were themselves directly based on the "rustic fool" characters of ancient Greek and Roman theatre. Rustic buffoon characters in Classical Greek theater were known as sklêro-paiktês (from paizein "to play (like a child)") or deikeliktas, besides other generic terms for "rustic" or "peasant". In Roman theater, a term for clown was fossor, literally "digger; labourer". The English word clown was first recorded c. 1560 (as clowne, cloyne) in the generic meaning "rustic, boor, peasant". The origin of the word is uncertain, perhaps from a Scandinavian word cognate with clumsy. It is in this sense that "Clown" is used as the name of fool characters in Shakespeare's Othello and The Winter's Tale. The sense of clown as referring to a professional or habitual fool or jester developed soon after 1600, based on Elizabethan "rustic fool" characters such as Shakespeare's. The harlequinade developed in England in the 17th century, inspired by the commedia dell'arte. It was here that "Clown" came into use as the given name of a stock character. Originally a foil for Harlequin's slyness and adroit nature, Clown was a buffoon or bumpkin fool who resembled less a jester than a comical idiot. He was a lower class character dressed in tattered servants' garb. The now-classical features of the clown character were developed in the early 1800s by Joseph Grimaldi, who played Clown in Charles Dibdin's 1800 pantomime Peter Wilkins: or Harlequin in the Flying World at Sadler's Wells Theatre, where Grimaldi built the character up into the central figure of the harlequinade. The circus clown developed in the 19th century. The modern circus derives from Philip Astley's London riding school, which opened in 1768. Astley added a clown to his shows to amuse the spectators between equestrian sequences. American comedian George L. Fox became known for his clown role, directly inspired by Grimaldi, in the 1860s. Tom Belling senior (1843–1900) developed the "red clown" or "Auguste" (Dummer August) character c. 1870, acting as a foil for the more sophisticated "white clown". Belling worked for Circus Renz in Vienna. Belling's costume became the template for the modern stock character of circus or children's clown, based on a lower class or "hobo" character, with red nose, white makeup around the eyes and mouth, and oversized clothes and shoes. The clown character as developed by the late 19th century is reflected in Ruggero Leoncavallo's 1892 opera Pagliacci ("Clowns"). Belling's Auguste character was further popularized by Nicolai Poliakoff's Coco in the 1920s to 1930s. The English word clown was borrowed, along with the circus clown act, from many other languages, such as French clown, Russian (and other Slavic languages) кло́ун, Greek κλόουν, Danish/Norwegian klovn, Romanian clovn etc. Italian retains Pagliaccio, a Commedia dell'arte zanni character, and derivations of the Italian term are found in other Romance languages, such as French Paillasse, Spanish payaso, Catalan/Galician pallasso, Portuguese palhaço, Greek παλιάτσος, Turkish palyaço, German Pajass (via French), Yiddish פּאַיאַץ (payats), Russian пая́ц. In the early 20th century, with the disappearance of the rustic simpleton or village idiot character of everyday experience, North American circuses developed characters such as the tramp or hobo. Examples include Marceline Orbes, who performed at the Hippodrome Theater(1905), Charlie Chaplin's The Tramp (1914), and Emmett Kelly's Weary Willie based on hobos of the Depression era. Another influential tramp character was played by Otto Griebling during the 1930s to 1950s. Red Skelton's Dodo the Clown in The Clown (1953), depicts the circus clown as a tragicomic stock character, "a funny man with a drinking problem". In the United States, Bozo the Clown was an influential Auguste character since the late 1950s. The Bozo Show premiered in 1960 and appeared nationally on cable television in 1978. McDonald's derived its mascot clown, Ronald McDonald, from the Bozo character in the 1960s. Willard Scott, who had played Bozo during 1959–1962, performed as the mascot in 1963 television spots. The McDonald's trademark application for the character dates to 1967. Based on the Bozo template, the US custom of birthday clown, private contractors who offer to perform as clowns at children's parties, developed in the 1960s to 1970s. The strong association of the (Bozo-derived) clown character with children's entertainment as it has developed since the 1960s also gave rise to "Clown Care" or "hospital clowning" in children's hospitals by the mid 1980s. Clowns of America International (established 1984) and World Clown Association (established 1987) are associations of semi-professionals and professional performers. The shift of the Auguste or "red clown" character from his role as a foil for the white in circus or pantomime shows to a Bozo-derived standalone character in children's entertainment by the 1980s also gave rise to the evil clown character, the attraction of clowns for small children being based in their fundamentally threatening or frightening nature. The classical pairing of the White Clown with Auguste in modern tradition has a precedent in the pairing of Pierrot and Harlequin in the Commedia dell'arte. Originally, Harlequin's role was that of a light-hearted, nimble and astute servant, paired with the sterner and melancholic Pierrot. In the 18th-century English Harlequinade, Harlequin was now paired with Clown. As developed by Joseph Grimaldi around 1800, Clown became the mischievous and brutish foil for the more sophisticated Harlequin, who became more of a romantic character. The most influential such pair in Victorian England were the Payne Brothers, active during the 1860s and 1870s. The contra-auguste plays the role of the mediator between the white clown and the auguste character. He has a lower status than the white clown but a higher status than the auguste. He aspires to be more like the white clown and often mimics everything the white clown does to try to gain approval. If there is a contra-auguste character, he often is instructed by the whiteface to correct the auguste when he is doing something wrong. There are two major types of clowns with "whiteface" makeup: The classic "white clown" is derived from the Pierrot character. His makeup is white, usually with facial features such as eyebrows emphasized in black. He is the more intelligent and sophisticated clown, contrasting with the rude or grotesque Auguste types. Francesco Caroli and Glenn "Frosty" Little are examples of this type. The second type of whiteface is the buffoonish clown of the Bozo type, known as "Comedy" or "Grotesque Whiteface". This type has grotesquely emphasized features, especially a red nose and red mouth, often with partial (mostly red) hair. In the comedic partnership of Abbott and Costello, Bud Abbot would have been the classic whiteface and Lou Costello the comedy whiteface or Auguste. 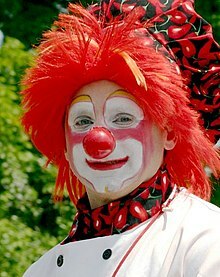 Traditionally, the whiteface clown uses "clown white" makeup to cover the entire face and neck, leaving none of the underlying natural skin visible. In the European whiteface makeup, the ears are painted red. Whiteface makeup was originally designed by Joseph Grimaldi in 1801. He began by painting a white base over his face, neck and chest before adding red triangles on the cheeks, thick eyebrows and large red lips set in a mischievous grin. Grimaldi's design is used by many modern clowns. According to Grimaldi's biographer Andrew McConnell Stott, it was one of the most important theatrical designs of the 1800s. America's first great whiteface clown was stage star George "G.L." Fox. Following English Joseph Grimaldi, Fox popularised the Humpty Dumpty stories throughout the land in the first half of the 19th century in America. The character clown adopts an eccentric character of some type, such as a butcher, a baker, a policeman, a housewife or hobo. Prime examples of this type of clown are the circus tramps Otto Griebling and Emmett Kelly. Red Skelton, Harold Lloyd, Buster Keaton, Charlie Chaplin and Sacha Baron Cohen would all fit the definition of a character clown. Clowns International claims to be the oldest clown society in the world. It was set up in 1946. Apart from being a membership organisation, Clowns International has set up a museum of clown memorabilia and a register of clown make-up. The latter also has a collection of full eggshells decorated as replicas of the specific clown's head. The World Clown Association (WCA) is a worldwide organization for clowns, jugglers, magicians, and face painters. It holds an annual convention, mainly in the United States. Clowns of America International, Inc. (COAI) is a Minnesota-based nonprofit clown arts membership organization which aims "to share, educate, and act as a gathering place for serious minded amateurs, semiprofessionals, and professional clowns". In the circus, a clown might perform other circus roles or skills. Clowns may perform such skills as tightrope, juggling, unicycling, Master of Ceremonies, or ride an animal. Clowns may also "sit in" with the orchestra. Other circus performers may also temporarily stand in for a clown and perform their skills in clown costume. Business — the individual motions the clown uses, often used to express the clown's character. Gag — very short piece of clown comedy that, when repeated within a "bit" or "routine," may become a running gag. Gags are, loosely, the jokes clowns play on each other. A gag may have a beginning, a middle, and an end — or may not. Gags can also refer to the prop stunts/tricks or the stunts that clowns use, such as a squirting flower. Bit — the clown's sketch or routine, made up of one or more "gags" either worked out and timed before going on stage, or impromptu bits composed of familiar improvisational material. Entrée — clowning acts lasting 5–10 minutes. Typically made up of various gags and bits, usually within a clowning framework. Entrées almost always end with a "blow-off" — the comedic ending of a show segment, "bit," "gag," "stunt," or "routine." Side dish — shorter feature act. Side dishes are essentially shorter versions of the "entrée," typically lasting 1–3 minutes. Typically made up of various "gags" and "bits," side dishes are usually within a clowning framework. Side dishes almost always end with a "blow-off." "Clown Stops" or "interludes" are the brief appearances of clowns in a circus while the props and rigging are changed. These are typically made up of a few gags or several bits. Clown stops will always have a beginning, a middle, and an end to them, invariably culminating in a blow-off. These are also called "reprises" or "run-ins" by many, and in today's circus they are an art form in themselves. Originally they were bits of "business" usually parodying the act that had preceded it. If for instance there had been a tightrope walker the reprise would involve two chairs with a piece of rope between and the clown trying to imitate the artiste by trying to walk between them, with the resulting falls and cascades bringing laughter from the audience. Today, interludes are far more complex, and in many modern shows the clowning is a thread that links the whole show together. Among the more well-known clown stunts are: squirting flower; the "too-many-clowns-coming-out-of-a-tiny-car" stunt; doing just about anything with a rubber chicken, tripping over one's own feet (or an air pocket or imaginary blemish in the floor), or riding any number of ridiculous vehicles or "clown bikes". Individual prop stunts are generally considered individual bits. In anthropology, the term "clown" has been extended to comparable jester or fool characters in non-Western cultures. A society in which such "clowns" have an important position are termed "clown societies", and a "clown" character involved in a religious or ritual capacity is known as a "ritual clown". The most ancient "clowns" have been found in the Fifth dynasty of Egypt, around 2400 BC. Unlike court jesters,[dubious – discuss] clowns have traditionally served a socio-religious and psychological role, and traditionally the roles of priest and clown have been held by the same persons. [clarification needed] Peter Berger writes that "It seems plausible that folly and fools, like religion and magic, meet some deeply rooted needs in human society". For this reason, clowning is often considered an important part of training as a physical performance discipline, partly because tricky subject matter can be dealt with, but also because it requires a high level of risk and play in the performer. In Native American mythology, the Trickster channels the spirit of the Coyote and becomes a sacred Clown character. A Heyoka is an individual in Native cultures who lives outside the constraints of normal cultural roles. The Heyoka plays the role of a backwards clown, doing everything in reverse. The Heyoka role is sometimes best filled by a Winkte. In this tradition, masks are made of clay while the creator's eyes are closed. A mask is made for each direction of the medicine wheel. During this process, the clown creates a personal mythology that explores their personal experiences. Actor in a clown costume (c. 1870). Joseph Grimaldi as Clown, showing his own make-up design. 1968 postcard of the main cast of Bozo's Circus (WGN-TV); from left to right: Ringmaster Ned (Ned Locke), Mr. Bob (bandleader Bob Trendler), Bozo the Clown (Bob Bell), Oliver O. Oliver (Ray Rayner), Sandy the Clown (Don Sandburg). Pierrot and Harlequin by Paul Cézanne (1898). Swedish actor Gösta Ekman senior (1890-1938) as a whiteface clown in the play Han som får örfilarna (He Who Gets Slapped) by Leonid Andreyev (1926). Typical aspects of an Auguste; white muzzle and eyes (Swedish actor Lasse Beischer [sv] in a performance of 1 2 3 Schtunk [sv], 2008 photograph). Emmett Kelly in his "Weary Willie" persona (center) with two whiteface clowns of Ringling Bros. and Barnum & Bailey Circus in a 1953 advertisement for the Pan-American Coffee Bureau. ^ Icelandic klunni, Swedish kluns "clumsy, boorish person"; c.f. North Frisian klönne and "kluns", also meaning "clumsy person". An alternative proposal derives clown from Latin colonus "colonist, farmer". The verb to clown "to play the clown onstage" is from about 1600. "Etymology Dictionary". Retrieved August 23, 2015. ^ From paglia, the word for "straw" (after the straw costume of the rustic buffoon character), or from bajaccio "mocker, scoffer". ^ A study by the University of Sheffield concluded "that clowns are universally disliked by children. Some found them quite frightening and unknowable." "Health | Hospital clown images 'too scary'". BBC News. 2008-01-15. Retrieved 2011-07-05. Rohrer, Finlo (2008-01-16). "Why are clowns scary?". BBC News. . The natural dislike of clowns makes them effective in eliciting laughter by releasing tension in acting clumsy or rendering themselves helpless. Durwin, Joseph (15 November 2004). "Coulrophobia and the Trickster". Trickster's Way. San Antonio: Trinity University. 3 (1). ISSN 1538-9030. Retrieved 2 January 2013. "Trinity.edu". Trinity.edu. Archived from the original on 2011-06-24. Retrieved 2011-07-05. ^ Tiffany McCoy, Clown Types Archived 2015-10-26 at the Wayback Machine (2010), citing Strutter's Complete Guide to Clown Makeup (1991). ^ "Egg Gallery". Archived from the original on September 7, 2013. Retrieved June 16, 2013. ^ "Clowning Framework". simplycircus.com. Archived from the original on March 13, 2016. ^ a b Bala, Michael (Winter 2010). "The Clown: An Archetypal Self-Journey". Jung Journal: Culture & Psyche. 4 (1): 50–71. doi:10.1525/jung.2010.4.1.50. JSTOR 10.1525/jung.2010.4.1.50. The one who swallows the largest amount of filth with the greatest gusto is most commended by the fraternity and onlookers. Wikimedia Commons has media related to Clowns.